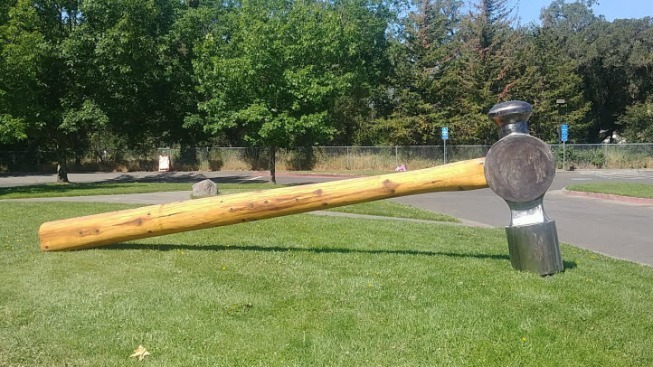 Healdsburg police said thieves stole an 800-pound metal hammer with a 21-foot-long wooden handle from the lawn of the Healdsburg Community Center on Friday night or early Saturday morning. The artist who created an 800-pound sculpture of a hammer stolen from a Northern California community center is offering a $1,000 reward to nail the thieves. The Santa Rosa Press Democrat reported Tuesday that Healdsburg artist Doug Unkrey made the offer. He made the 800-pound ball-peen hammer out of mixed metals. It has a long redwood handle and measures 21 feet long and the head is 6 feet tall. Unkrey says it would have required about eight people or a flatbed trailer with a winch to carry off his work.